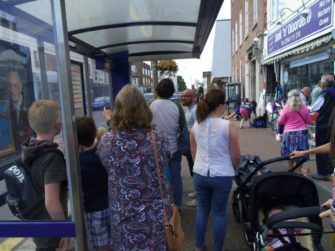 Southend, and thereabouts, has an open top bus service again this year, for the duration of the school holidays. 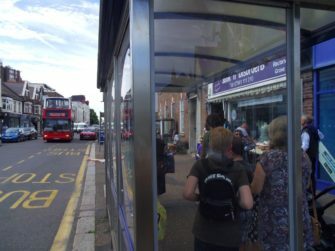 Surrey-based Go Ahead London in Merton have risen to the challenge and seem to have got it right, even with some of the unsettled weather we’ve been having this summer. This recording is from the stop in Rectory Grove, Leigh-on-Sea waiting for the 2.18pm on a sunny day, a round trip along the high ground of Leigh, down to Chalkwell, onto and along the seafront to Westcliff and Southend, turn ’round at The Kursaal and finish at Adventure Island then back to Leigh but via Bell Wharf and Leigh Station before Rectory Grove again. You hear the chatter of the waiting passengers, they start to board in the second part, ticket sales in part 3 and taking the children up the stairs to finish with a couple of Scots accents, flying back the next day with tales of the sights and sounds of Essex I’m sure. This was a success, so this year it runs over this coming late May Bank Holiday and then from the 9th of June, same prices and same hourly service as last year for 6 weeks, and then for the school holidays it moves to a new half hourly service so plenty of chances for you to listen in as you take that trip through Leigh and along the seafront.